Here you have the 3rd part. 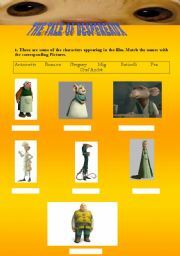 I had to remove some of the pictures the worksheet had ´cos I couldn´t upload it, but you can always find a nice one to insert, right? 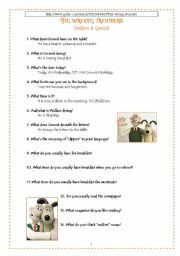 Here you have the 2nd part of the worksheet for the video on Wallace & Gromit. It has the answers so you just have to remove them for the students. 3rd part is coming. Finally this is the 4th and last worksheet. I am really sorry I had to split it into so many parts. You can always add other activities or change the pictures etc. I hope you will like it and so your students will. 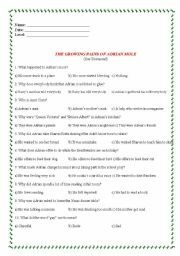 Test on "The growing pains of Adrian Mole" by Sue Townsend. This is a multiple choice exam on the book by Sue Townsend. It has the results at the end for the teachers to have them in a quick manner withouht having to go throught the book. 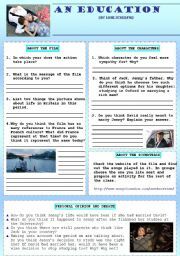 Here you have a simple worksheet to work on a funny subject: movie titles. In Spain, for example, where we have all the films dubbed, most times the translated title has NOTHING to do with the original one. 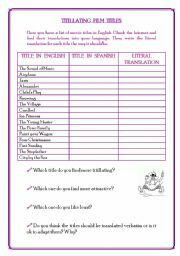 This serves the students to do some research on films, look for their translations and think about how they´d do it. It´s funny. Activity on the Paparazzi song by Lady Gaga. It is an activity to work on different fields. The students will use mostly the simple present and will have to read the song and listen to it repeteadly in order to find the answer to different questions about colours, parts of the body, clothes, etc. They will also have to find synonyms and superlatives, comparatives, etc. 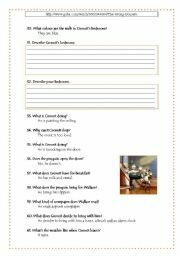 This is a worksheet on the film Despereaux, which is actually an excuse to deal with the topic of food, animals and physical description. I´ll try to upload it in just two parts. This is the first one. 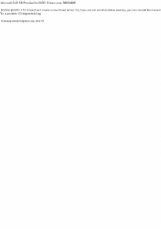 This is a powerpoint that contains a summary of the most important modal verbs. Each slide has an example sentence to clarify the meaning. How to write informal letters. Here you have a powerpoint that explains, step by step, how to write an informal letter in English. I hope you´ll find it useful. My students do! 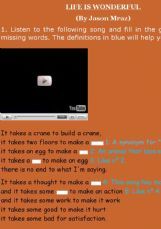 Simple ppt to show the basis about the formation of causative sentences. Short video about Lady Di for the students to listen and answer the questions. THIS IS THE LIFE. Song by Amy McDonald. 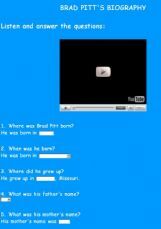 Here you have the famous song "This is the life" by Amy McDonald for your students to listen and fill in the gaps. There are also some questions at the end for them to answer. 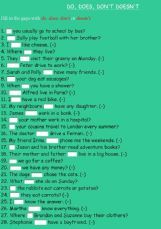 Here you have 40 sentences for the students to practice questions with do/does/don´t/doesn´t. Collocations with do and make. 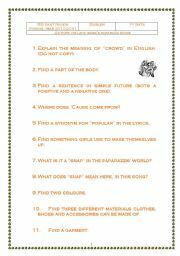 This is an exercise for the students to practice their skills on collocations with do and make. This is a short video about Brad Pitt´s life. The students have to listen to it and answer the questions. 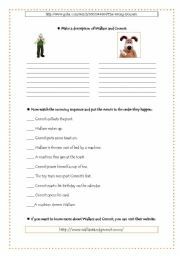 Here you have 30 sentences for the students to practice the simple past and the past participle both in the postive and negative form and questions as well. 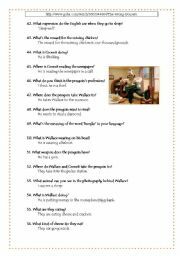 Here you have 30 sentences for the students to practice there is and there are for a few minutes. The more they practise, the better they assimilate it. The students are expected to listen to the song and fill in the gaps. They have simple definitions to help them find the right words. 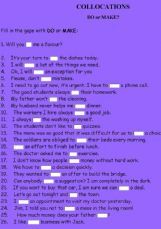 Here you have 50 sentences for the students to practice the conditional sentences. They must have learnt the structure first as the exercise deals with the three kinds of conditionals. 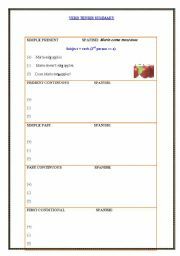 It is also a good way to revise the simple past and past participle of the irregular verbs.